You’ve heard that Dodie Smith quote about family before, right? Well, now you have. It was always bizarre to me. It’s accurate, but I wouldn’t use it in my scrapbook or something. My pet octopus is big enough to stretch across the continental United States, from the east coast (and I do mean coast literally) to the southwest. The last time we were all in one place was two years ago. A lot has happened in two years. Like the birth of three more babies. Yeah, that’s kind of a big deal. Last week, my octopus converged in south Alabama, and it was noisy, chaotic, and glorious. Growing up, there were six of us under one roof, and for the first fourteen years of my life until my brother moved out, it was a very small roof. 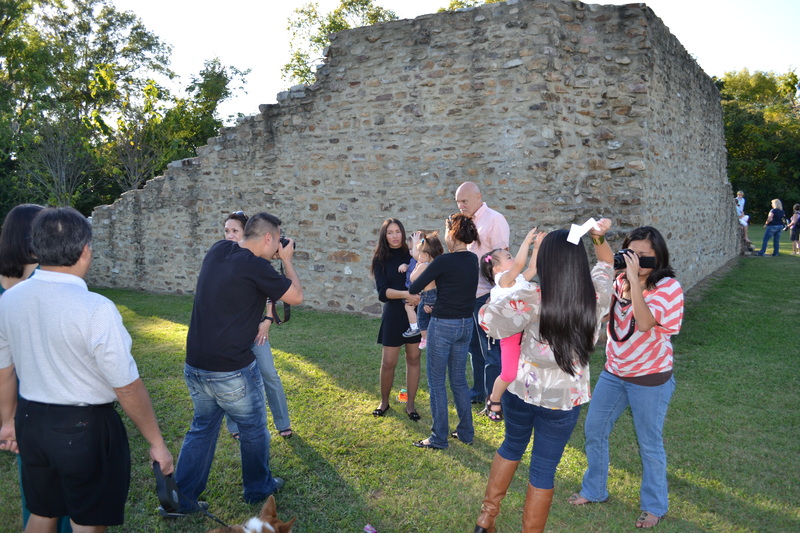 We’re all slightly candid because during our family photo shoot, we each brought our own cameras. There were four (five?) lenses firing off excessively. It was fun. I don’t know why it gets Lady Gaga all in a tizzy. I feel like this photograph pretty much encompasses our entire time together: chaos, a collision of good looks, and an ongoing game of Where’s Waldo?. Except instead of Waldo, we were looking for one or more of the babies at any given time. Aunt Stinky Face is taunting Bean with a piece of paper, Moms is looking concerned, a wonky-eyed dog is photobombing, Bug is MIA, my brother and I are being dorks by taking pictures of each other taking pictures. So, yeah, all-encompassing. There was so much hilarity and satisfaction and noise and enjoyment in one place, I’m surprised the city didn’t implode. We don’t get together anywhere near often enough, so when we do, it’s like a volcanic eruption of fun spewing all over anyone within shouting distance. 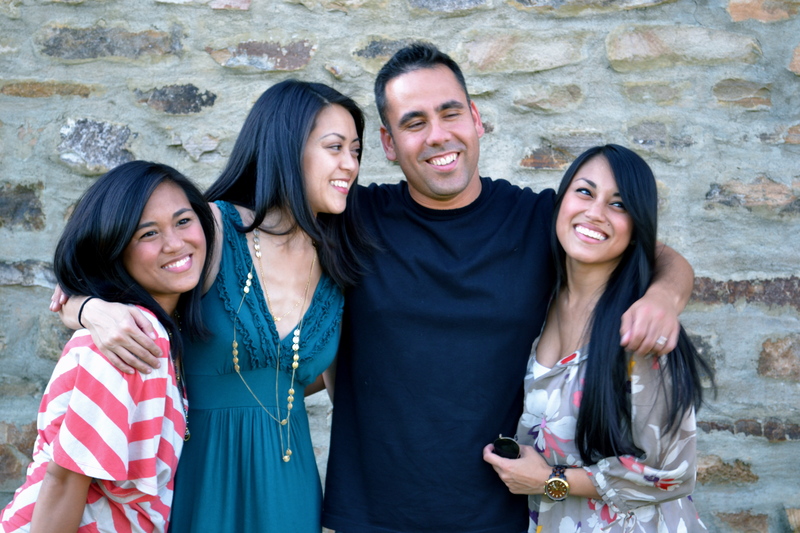 My family is my role model. If I can help foster and nurture an environment where my children can have even just a shadow of the bond between my siblings and me, then they are in for a lifetime of love. Such a weird quote. True, though. And I agree, it wouldn’t be a scrapbooker’s delight. So glad you had some great family time filled with laughter and inside jokes! It’s not the most graceful way to describe family, but it works. And me too, I’m so glad we were all able to gather! This spring, my mother-in-law turns 70. She has one son (my husband) and three daughters (sound familiar?). I love all my in-laws like crazy and realize I am very lucky to have FOUR women who adore my husband but who somehow tolerate me. Anyway, we are hot and heavy into plans to get all the kids, spouses (spice!) and grandkids (8 of them) together in one place to celebrate her milestone next year. It may actually (unexpectedly) happen this Thanksgiving if the stars align. Your post here? Made me all the more excited. Even if there are a lot of candid pictures of us taken. Because really. Lady Gaga needs to chill. I will now forever refer to the plural form of spouse as spice. You all are going to have an amazing time. Everyone needs to bring a camera. And hire a professional photographer to join the mix. They’re good at organizing chaos just long enough for photographic evidence. “Lady Gaga needs to chill.” -Julie, plus every other American. We had a family reunion a couple years ago and I was surprised how meaningful it was. We’re a pretty distant extended family, but it was interesting seeing the connections. It’s funny how different people can get along if they’re required to. I think one of my aunts has that quote cross-stitched on a pillow somewhere. Ok, not…but it sure does fit! I’ll cross-stitch one just for you. Well geesh. 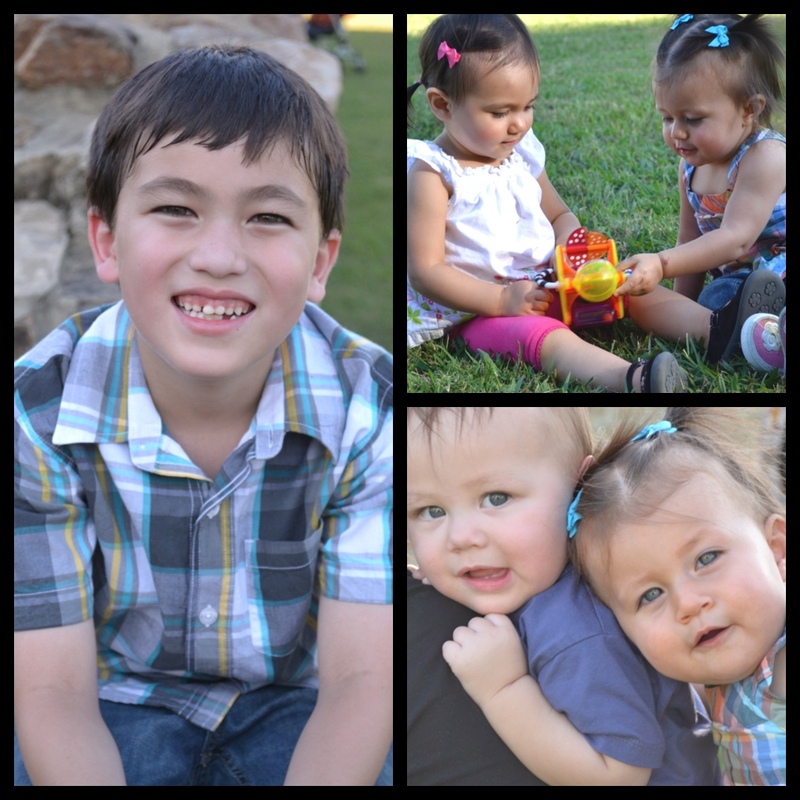 Could your family be any more gorgeous?! My extended family is pretty spread out, but luckily my immediate family is still all in New Jersey, so we get together fairly regularly (birthdays, holidays, etc.). Thanks, Jules! I would love for all my siblings to be in one place, especially with my new niece and nephew to dote on. My family reunion fits in a booth at a restaurant. We’re more squiddish which should be confused with Quidditch, a game Harry Potter played. He didn’t have any family either. Can Harry and me go to your next family reunion? Whaaat! If you’re bringing Harry, then yes. A thousand times yes. Jess: You are so fortunate to be blessed by so many wonderful (and — um — gorgeous) people. Some really good genes there. And jeans, too. Wow, my extended family is never hanging out with your extended family . Can I join Clay at your next reunion? I’ll use my best southern manners and turn on my “y’all”? Heck yes! The more the merrier! You don’t even have to bust out the “y’all” because I’m the only one with a certifiable southern accent. My family reunion would be more like Clay’s. We could sit in the booth across from his. Thanks, Annie! But YOUR kids will have a reunion more like mine when they get older. Guaranteed!